Lots of people prefer Glock pistols for tactical and self-defense purposes. Compact and lightweight, it’s the handgun you can depend on. However, having a handgun with you is not entirely enough especially at night. When you’re fumbling, for instance, you’ll have a hard time aiming your gun. This is where night sights come into the picture. The best Glock Sights for different pistols serves as your solution in aiming straight. Find out more in this article! The best Glock sights are those you can depend on even in bright surroundings; not just from the usual low light and night conditions. Protecting yourself from those who wish you harm not only happens in the dark, so you need to prepare for the worst. Through our reviews, we give you 7 best glock sights on the market with their respective pros and cons. Brite-Site TFX Pro by Truglo is different from standard night sights because it makes use of both tritium and fiber optics as light sources. Since it makes use of both materials, this will guarantee you an unlimited glowing all day and night. The physical appearance of Truglo Brite-Site TFX Pro is quite appealing. Aside from the CNC-machined steel that adds to the durability and robustness of the night sight, it also makes use of chemical and shock-resistant capsule to house the glow elements. It is said to be virtually indestructible and well protected from rust, oils, chemicals, harsh cleaning solvents, etc. 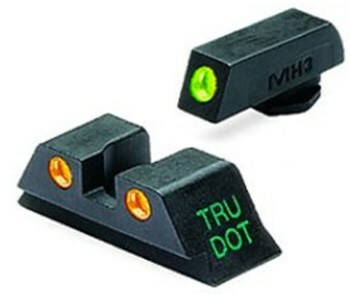 Truglo Brite-Site is a three-dot configuration night sight. The front sight has a highly visible white ring to assist you in a fast and accurate target acquisition. Subsequently, the rear sight has two green dots which aid to the visibility and enhance focus to the front sight. Though this setback is not directed to the all of the Brite-Site sights, we observed that the front sight wasn’t as snug as expected. It gets loose after many rounds of shooting even if it was tightened earlier. Brite-Site fits on standard holsters and a great number of Glock pistols. The Meprolight brand is well-regarded by various law enforcement agencies around the world. Its versatility and brightness are highly recognized. Their Tru-Dot Night Sight series fits most Glock 9mm models such as Glock 17 and Glock 19. The Tru-Dot is specifically designed for use in any light conditions. This Meprolight model features three dots, the two of them at the rear bear the yellow color while the front sight or also called the main dot is green. Among other light color combos, the yellow/green is most preferred by the shooter because the contrast between the two makes up for faster target acquisition. The glowing lights of the night sight don’t need batteries to power them up. Meprolight makes use of tritium lamps for this model which is suitable for any lighting conditions. Tru-Dot is one of the cheaper night sights on the market, but their quality is not of low quality. The housing is made out of metal while still retaining its light weight. You can choose between a fixed and adjustable version. Some light combinations can give you a disadvantage such as the green/orange combo. The orange tritium dots at the rear sight aren’t as bright as their yellow or green counterparts. Dim colors like orange make it harder to distinguish. Furthermore, they are indeed long lasting and doesn’t need much maintenance after years of usage. Meprolight night sights are inclusive of the 12-year illumination warranty provided by the company. If you’re more on the traditional side and prefer white light, this night sight is your best option. Though its front sight is not of green color, you can expect this Glock sight to function well in all lighting conditions. XS Big Dot is highly recommended for self-defense or combat situations wherein you shoot your target at close ranges. It is not expected and not designed for range shooting. Being a self-defense night sight, it is imperative that the front dot should be big. Its function as a sight optimizes your speed and visibility. The white dot is easy to differentiate and has good contrast between the target and the background in any lighting condition. The brightness of the single dot on the front sightis determined by the glow-in-the-dark paint and the tritium light. The paint is suitable for daytime use to enhance its visibility. Then, the rear sight of XS Big Dot features a shallow V-platform. Though the rear sight is not the same as others (i.e. two dots), XS Big Dot instead has a rectangular lining with the same paint as the front. This is for added visibility. Dotting the “i” is the proper sight alignment. This isspecially true at close ranges (0 to 15 yards). However, at ranges over 25 yards, you should use the top of the big dot as your aiming point because it’s the point of impact. Keep in mind that this Glock sight is not designed for long distance shooting. It’s designed specifically for self-defense/tactical purposes. The wide gap between the front sight and rear sight makes the target acquisition fast and easy. The installation of XS Big Dot sight may require you to be cautious. This is because the front sight screw is not up to par and could break easily. This Glock sight is easy to install because of its snag-free design. It fits well to many Glock models like G17/19/22/23/24/26/36 and many others. Glock sights by Truglo are affordable, but their product quality is not sacrificed which makes Truglo a good investment for your money. This particular model featured in this article only have tritium sights, but some others have a combination of both tritium and fiber optics. Don’t worry, the tritium sights delivered by Truglo are still as bright as ever so you can use it in the dark. This night sight features a CNC-machined steel construction highlighting its reliability and durability. The material used doesn’t weigh the Glock pistol down and has a snag-resistant design. The design of this Truglo night sightconsists of three dots. The center dot is at the front sight while the rear sight has two tritium lights located side by side. It’s guaranteed to be bright as the dots are colored green. Unlike other sights, Truglo requires a special tool to install and remove the front sight. Also, the brightness of the tritium can’t be compared to be at the same level with Meprolight and Trijicon Glock sights. Thus, Truglo’s lighting is rated as moderate when in use at daytime. This particular model fits most Glock pistol models as long as they are in the 9mm, 10mm, 40mm, and 45mm calibers. Ghost ring sights are designed originally designed for long guns. But they are now available for small guns. This Ameriglo Glock sight is ideal for low light conditions and daytime usage. Its design and size fit to most Glock models and a fresher face compared to the standard night sights. A ghost ring sight has both front sight and rear sight. Sighting targets can be seen through the aperture rear that is quite large. Because of its size, it fuzzes or ‘ghosts’ when you mount your gun to your shoulder. The focus through the aperture is the large front sight. What differentiates a ghost ring sight from the others is its rear sight. As you have observed, two green dots surrounding the ring direct your eyesight into the ring. Alignment is the same as shooting long guns and keeps your eye position aligned with a better focus on the front sight. Aiming is then precise, and the sight optimizes your speed. The front sight of this Glock sight features a long tritium tubing with white outline. Even at night, the tritium-filled tubing are very bright which make them easy to see at any angle. Being a tritium sight, you don’t need batteries as a power source. Thus, this makes the night sight longer lasting and maintenance free. Glock Ghost Ring by Ameriglo is made of polymer. Polymer, as we know, can be weak and not as resistant to shock unlike night sights with metal housing. Ameriglo Glock ghost ring sight fits Glock models such as 17/19/22-24/26/27/33-35/37/38. 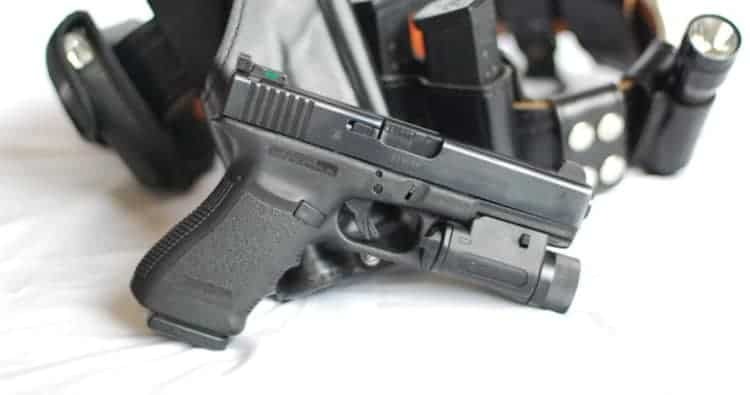 Although this Glock sight is more emphasized to be used for popular Glock models such as Glock 17 & 19, this also fits other Glock models (22, 23, 24, 26, 27, 33, 34, 35, 37, 38, and 39). This is highly recommended for competition shooting. The Pro I-DOT is a two-dot sight that houses two green tritium lights as sources of light. These dots don’t need abattery to power them, so they are long lasting and don’t need any maintenance. The Pro I-DOT’s construction makes use of full steel alloy metal to enhance its durability and sturdiness. The design is a little bit different than the standard night sights because its square-shaped rear notch extends to the end of the slide. This, in turn, effectively eliminates the glare experienced. The front sight houses one tritium light outlined with either orange or white (depending on your choice) and gives a visible focus extending tens of yards away. Ameriglo Pro I-DOT sight’s quality is good overall with minimum setbacks. If there’s an obvious drawback to be acknowledged, it is the sight’s attachment to the pistol that can be not as snug as it ought to be. The tritium lamps of this Ameriglo night sight make use of Swiss tritium that lasts up to 20 years without dimming or fading. The brightness of the night sight is something to be worth mentioning because it’s certainly brighter than other brands. Shooting at nighttime and daytime turn to be an easy feat! Trijicon HD is your best option if you have a lot of Glock pistols and want to invest in just one night sight. This one here is versatile and mounts to 18 different gun models of Glock. In fact, the Trijicon HD is designed specifically for use in tactical operations. And so, its speed and fast target acquisition are its main selling points. This sight’s front sight consists of an extra-large dot tritium lamp. Depending on your liking, you can choose between the orange and yellow front outline. The front outline has a glow-in-the-dark photoluminescent powder that adds to the visibility of the tritium, especially at night. To add more detail the tritium lamps, they are enclosed in glass lamps and are well protected by aluminum cylinders from abrasions and recoils. Trijicon HD also makes use of sapphire jewel caps for protection as well as the immense light distribution of the tritium gas. Because of these protective features, the night sight is not affected by the harsh cleaning solvents. Trijicon HD is made out of steel which ensures the durability and lightness of the sight you will be using. The aesthetic of the night sight is a three-dot configuration. The large front sight is a width of .144 inch and fits well when you view it from the rear sight. The rear sight has a U-notch design and houses two dots with black painted rings. These two rear dots add more focus on the front sight. There is one shortcoming of the Trijicon HD which compelled them to release an updated version called the Trijicon HD XR. They improved the front sight by shortening its width. The XR version now measures .122 inch. The Trijicon HD’s front sight was observed to be a little crowded, making shooting at longer distances not as smooth as the Trijicon HD XR. The accuracy of Trijicon HD is still remarkable despite the mentioned setback. It is exceptionally accurate from close to mid ranges. The rear sight design and the photoluminescent front sight were the reasons for this feat, but the same result is not guaranteed in long range shooting. The illumination of the tritium lamps is estimated to last at least 12 years. After buying the best Glock sight for your Glock 17 or 19, the next step is, of course, theinstallation. First, go through the same safety checks such as removing the ammo. Installing the housing of the Glock sight to the handgun is not hard as long as it matches to your model. Next thing to do is to mark the center of the sight by using markers to get the right alignment. You should also remember to apply a small amount of adhesive at the point of the weapon that will contact with the front sight. This will ensure that the front sight will adhere to your desired alignment. Glock pistols are acknowledged to be proficient in conceal carry. From the frame of the Glock to its magazine body, they are all made of high-strength nylon polymer which increases durability. It is also observed to be more resilient than other metal-framed guns. The polymer used is also resistant to shock and extreme temperature. Because of the fact that the Glock is mostly hard plastic, it is imperative that its accessories should also use the same material or at least the weight of the accessory won’t wear the weight of the gun down. The night sights for Glock have excellent compatibility and quite a good deal to have. Night sights for Glock pistols are also good for daytime usage, but not as bright as you use them at night. Common night sights don’t need batteries as a power source. What makes them visible at night or daylight is composition inside the tubing. For a first timer buyer such as you, some night sights use tritium, a chemical identified as a radioactive isotope of hydrogen. Its radioluminescence creates a fluorescent light with no need of electrical energy. Moreover, though it’s radioactive, it doesn’t pose any threat because the tritium gas isusually encapsulated in a non-hydrogen-permeable container. A newer innovation has entered its way to the market. The use of fiber optic tube in sights was very beneficial to the users because the material glows brightly even innormal light. Also, it has many colors to choose from. The glow coming from the fiber optic is concentrated and doesn’t magnify. This aids you to see your target clearly because it’s not too bright and doesn’t obscure the target in any way. However, the use of fiber optics in night sights means that it won’t last very long due to its chemical composition. This is unlike the tritium sights in which they last at least a decade before fading. The Glock sights are recommended to be made of metal such as steel or aluminum. They don’t add much weight to the pistol and can take quite a beating from the repetitive recoils. A plastic housing is not recommended because it has chances of breaking at some point. The best Glock sight is something that can be used even if it’s daytime or nighttime. It’s imperative that not all attacks happen at night so better be prepared for worst case scenarios. The night sight you should get must have fast target acquisition. The front sight of a Glock sight is preferred to have a large dot so that your focus is towards the front and not at the rear. The profile of the front sight is typically in a semi-ramp style. Here, the face of the sight is facing away from the shooter and the best choice to reduce the snag profile. Night sights come in varying widths for the front area. Depending on the width, it would affect the speed and accuracy of your Glock. Of course, there are disadvantages if the front sight is too wide. It would pose problems when you acquire thetarget at longer distances. 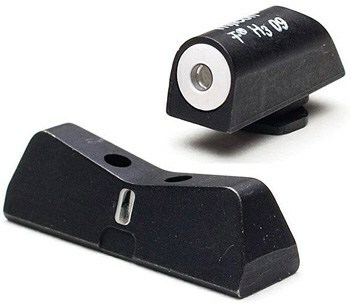 Commonly, the rear sight of most night sights for Glock features two dots located side by side. They can either be painted or tritium. The rear sight helps you get the best possible shot because it gives off a softer glow to emphasize the front sight dot. Three-dot sight – Most handgun sights have three dots on them, two at the rear and one at the front. 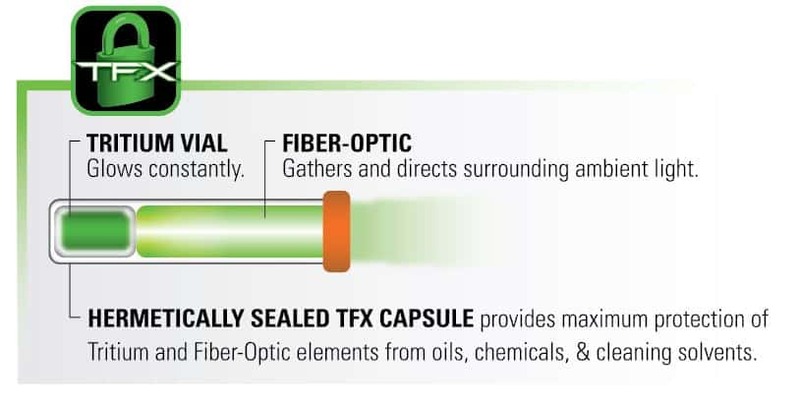 These night sight can either have fiber optic or tritium inserts or a mixture of both. Two-dot sight – This kind of setup features a smaller dot at the rear and a large dot at the front area. Of course, the front sight is brighter while the rear sight focuses more on giving a soft glow to emphasize the main dot. I-dot sight –This type has a large dot on the front sight, and the rear sight has a line painted under the notch. When aiming, you have to dot the “I” which means that the center of your aim is the center of the dot. U-shaped rear sight – This type is commonly used by shooters into target competitions. The setup makes it easy to aim at long distances. Owning one of the modern Glock handguns means that there are a wide lot of night sights in your arsenal. The best Glock sight is whatever works best for your situation. There are night sights intended for a specific purpose so you should evaluate your prospective Glock sight. Now that you know the guidelines on how to choose one, be prepared for an excellent shooting experience! I’m agree with you that TruGlo TFX Pro is the best. I have it with my glock 19. It incorporate both fiber optics and Tritium, plus all the other features that you mentioned on the other sights.